﻿“Namaste” is a Hindi word taken from the ancient Sanskrit language. It is used as a greeting, something like saying hello and welcome but more respectful and a bit more meaningful. Like saying I see and respect you. So we would like to extend a warm नमस्ते to our new tenants Raj & Gio at namasteyogaashram.co.uk. They moved into one of our hillside units only a month ago and have transformed it into an Ashram (Temple). Where they provide instruction in the ancient art of Yoga and practice a range of healing treatments to help restore your mind and body. "It's incredible how time flies. We opened the doors of our new YOGA Ashram a month ago, already!At the Ashram we are working hard to make it even nicer and cosier, and the second bathroom with shower is nearly ready. Hurray! Yoga classes are getting busier andit's always lovely to share the nice vibes after yoga having a cup of tea with some biscuits and cake. Vegan of course! We are very happy and grateful, and we would like to share yoga even more.That's why we are keeping the price of the unlimited monthly membership very low, £38/month for 3 months.All the classes you want when you want! Until the end of October you can also enjoy the benefits of Gio's healing treatments, Reiki, Shiatsu, Reflexology, or sport massage. 3 treatments at £60! 1 hour each, valid for 6 weeks. Bring your friends, the first class is free. Have a look at the yoga timetable, choose day and time, fill the form with your info, and redeem your class with the code FREEYOGA. Progressive discounts on membership and voucher for massages and workshops for every friend referred who join us. 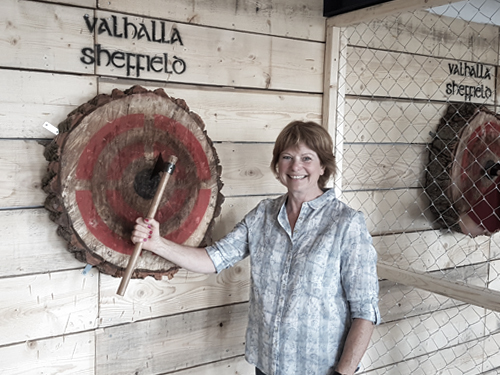 ﻿We are excited to welcome Valhalla martial arts & axe throwing to Sheafbank. Luke from Valhalla has transformed his unit into Sheffield’s first indoor axe throwing range and martial arts training area. With Axe throwing classes and regular sessions in self-defence and Historical European Martial Arts. In Norse mythology, Valhalla is the resting place of fallen warriors, where they train for the great battle Ragnarok. A fitting name for a place where you can unleash your inner Viking. With 90 minute instructor led sessions aimed at giving a unique Norse experience. Valhalla is the perfect destination for birthdays, celebrations, stag and hen parties, corporate team building or if you just want to let of a bit of steam! We are really excited to have this unique business call Sheafbank home. Check out Valhalla’s website, Facebook and Instagram.